A bit of group history – Founded in 1967. 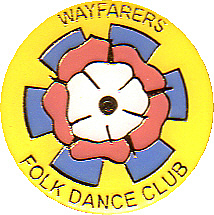 Wayfarers, a folk dance demonstration team, is affiliated to the English Folk Dance and Song Society. Main activities – We always dance to live music. Our musicians play a range of instruments including accordion, keyboard, mandolin, banjo, recorder and concertina. Dances are introduced with information and humour. A small example of our activities include performing at various National Trust Houses, the Shakespeare Birthday Celebrations, Festivals and Charity Events. 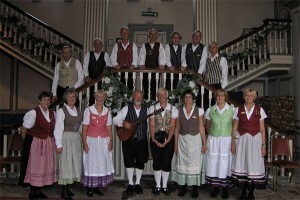 We perform at weekends and evenings at fetes, festivals, sheltered accommodation etc. Many of our members enjoy calling, dancing and playing for social folk dance clubs. Our costume – On show we always wear costume. There is, however, very little to say about our costume other than it is colourful. Membership – The team comprises 20 adult and 2 junior dancers and 4 musicians. Traditional local events and festival participation – We enjoy both hosting and visiting dance groups from abroad. We performed at dance festival to celebrate Funchal’s 500th anniversary in Madeira. We have recently had exchanges with groups in Sweden, Switzerland, Austria, Germany. We are looking forward to visiting the Isle of Man this year to help the MFDS celebrate their 60th anniversary.